Busting Ocean Myths: How many containers are really lost at sea? The Claim: 10,000 containers are lost at sea every year. Who said it: Monterey Bay Aquarium Research Institute, Slashdot, Yahoo News, NOAA, me, and many others. 10,000 is one of those numbers that’s big enough to be surprising, but not so huge to inspire immediate incredulity. The worldwide shipping industry is enormous and containers do get lost overboard. With a few recent high-profile maritime accidents, it’s not hard to believe that 10,000 containers could be sent to swim with the fishes every year. The MOL Comfort breaks its back. Image via gCaptain. Fortunately, it’s pretty hard to hide a missing container and the number of containers lost at sea is actually much lower than 10,000. In 2011 and 2014, the World Shipping Council surveyed it’s members to find out exactly how many containers are lost at sea each year. What they found was that not only was the number of lost containers an order of magnitude less than the 10,000 figure, but that the average was driven up by two catastrophic accidents–the sinking of the MOL Comfort and the grounding of the MV Rena. Between 2008 and 2013, and excluding these two maritime disasters, an average of 546 containers were lost at sea. When Comfort and Rena are added to the equation, that number climbs to 1,679 containers per year. 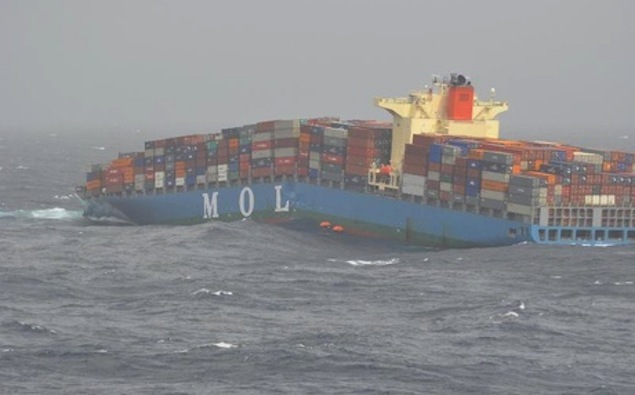 The MOL Comfort, which broke in half on June 17, 2013 and subsequently sunk during a prolonged attempt to recover her stern, was the worst container ship disaster in history: 4,293 containers were lost in a single incident. The MV Rena grounded on a reef of the New Zealand coast in late 2011, spilling 900 containers over the side. Even with these two maritime tragedies, the number of containers lost at sea each year come nowhere close to 10,000. When you consider that roughly 120 million containers were moved across the ocean in 2013, 1,679 lost containers per year seems positively minuscule. Busting Ocean Myths: This anglerfish is not as kink as you think. Fun Science FRIEDay – All About the Benjamins Baby!